Question 1: Why are experiences more important today than ever before? A1: . @TheSocialCMO Thank you so much for having me on again. This is always one of the most invigorating conversations I can be part of. A4: Customers are sharing experiences about your business now. Why leave them to chance. Define them at every step! Question 2: In the book you say experiences are even more important than products! Bold statement can you share your reasoning on this? Questions 3: Seems like everyone is talking about disruption. You’re saying disruption is more than just social media, can you elaborate? A2: Social is just one part of disruption. 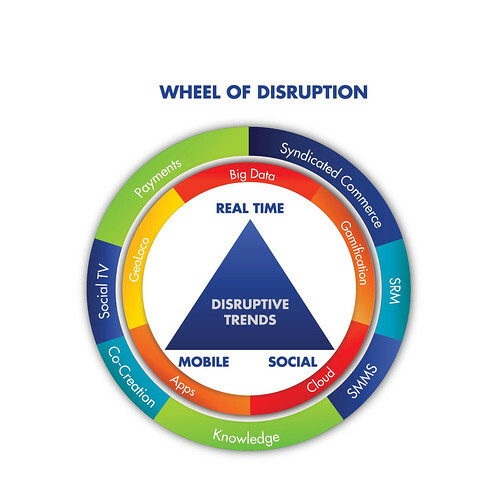 I call it “The Wheel of Disruption” and it includes big data, mobile, real-time, etc. Question 4: Need for more emphasis on experience is clear in the book. How is user experience now starting to influence business decisions? Question 5: In WTF? There seems to be underlying story recounting the hero’s journey. Can you share your thoughts with us on this journey? A1: A VERY GOOD QUESTION! A2: Joseph Campbell’s Hero with a 1000 Faces has influenced so many, including Hollywood…Star Wars, The Matrix. 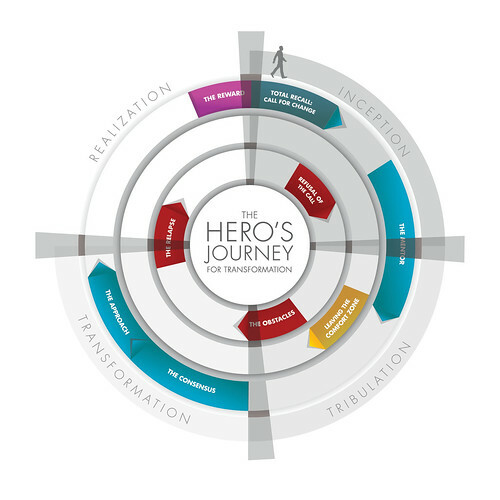 A4: I revisit the Hero’s Journey from the standpoint of your customer. What is their journey? What is their experience? Question 6: Brian, love design of the book. I understand in this case it wasn’t your typical publisher process, how was it different? A1: Number 6 is great too! A4: The book is square, think coffee table format, 4 color, full of visuals, and its designed to be an analog (mobile) app! 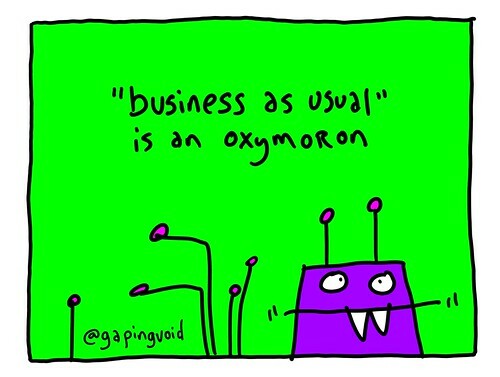 A5: @gapingvoid provided an original piece of artwork for each chapter based on what he took away after reading it. A9: Thank you everyone. You always get my mind racing with possibilities! The full transcript including all responses, questions, and answers is here. and pay it forward with sharing my knowledge and experience with others. Brian, as always, you are leaps and bounds ahead of the echo chamber. Phenomenal work! LOVE this comment! Thank you! thanks again Brian for bringing up such a great topic! And yes putting individual customers at the center of the relationship is key…giving them the ability to cross the sales point, in order to reach out to the marketing and biz dev people (not exactly, but…). I think that the luxury business, quite surprisingly, has started to understand the paradigm shift in customers’ behaviors. People who are used to consume luxury services or products give the same answer about the same question: they value most the experience! And the luxury resorts niche has been one of the first movers. Excellent Ben. Great connection between luxury and experience…. Brian this is really really awesome work. Thanks for sharing the conversation. Hi Brian, what a great activity to be involved in and some really insightful clips from your book which I am now in the process of ordering so that I can read it all. I came across your site as I was searching for information on experiences and marketing via experiences as it’s a topic I have a lot of interest in. I believe there is a new approach to strategy development that we need to be moving towards – experience-based strategy – and I’m on a journey to define how best to go about founding this in the very route of the businesses we work in. Albeit it early days, and you are clearly ahead of the game (thanks for pioneering!) this does get applied at the executional stage, although usually by mistake rather than intention. There has to be a model that can start us engaging in an experience-based strategy from the very root, so that no matter what grows from the seed, it encapsulates experience throughout. I will keep reading and perhaps share some thoughts as they begin to take more shape. Future of business indeed lies in sharing experiences and making these experiences part of your business cycle.It help customers narrate their brand stories and also leads to brand recall, a characteristic feature of successful brands.I am happy to be part of a team at Synechron where client are encouraged to share their working experience which helps us to serve them better. advertising within a public relations standpoint?